I am so glad that our whole school is using Seesaw this year as a portfolio for student work as a communication tool for parents. And selfishly, I am loving it for the library. At the beginning of the year, I asked our Instructional Technology Specialist, to add me as a teacher in all the classes. I was then able to add a library folder in every class where students can put any work that we do in the library. While I thought this would be the only benefit, that I would be able to keep a "portfolio" of their library work, I am finding many more benefits as the year goes on. 1. Parents can see what we are doing in the library! When students are putting the work in the library folder, parents see that the library is a place where learning is happening. Of course these are things I normally would have sent home on paper, but who knows if they actually made it home or not. 2. 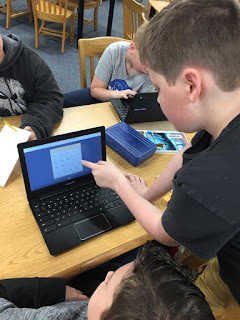 I can explain what we are doing in the library and show how it relates to what the students are doing in the classroom. 3. I can send my newsletter and other notes directly to parents. Although it takes me about 10 minutes to post in all the classes, at least I am sure the parents have a better chance of seeing it than if I sent a paper copy home. 4. I can see what classes are doing in other subjects- because I am nosy that way LOL. It does mean that I get notifications on every class though. At the beginning of year, I sat with our 1st grade teachers in a meeting with the reading specialist assigned to our campus as she talked with them about reading and writing. One of the things she mentioned was noticing how authors used different things in their writing and then encouraging the students to try it in their own writing. I decided that I could do that in the library. I read a few of Mo Willems Elephant and Piggie books to them and we talked about how he used speech bubbles to show what Gerald and Piggie were thinking and saying. Then they went to a template I had uploaded in Seesaw for them. We looked at the pictures in the frames and talked about how the speech bubbles. Students then went to work adding in the dialog. However, one clever little guy really understood the idea of a joke and came up with this (his teacher did help him with spelling). The video is only 13 seconds long, he doesn't press stop though which is why it keeps recording. Oops. 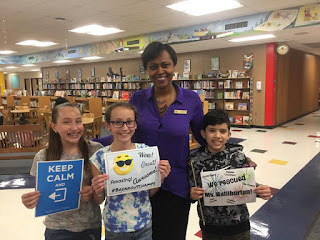 Instead of doing my traditional "where are things in the library" orientations for 3rd-5th grade this year, I decided to do a reading interest inventory and goal setting activity with them instead. 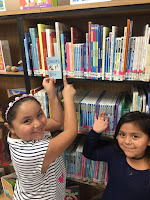 Over the summer I had been looking at reading interest inventories from Pernille Ripp's website and Donalyn Miller's book The Book Whisperer and then with my librarian friend, Natalie Watts, combined ideas together to form one of our own. 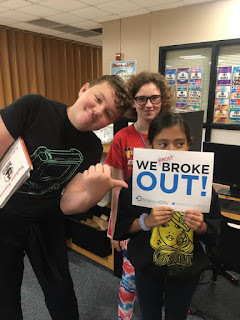 So after reading Hooray for Books to them and talking about my own reading goal for the library this year (read about that here) we went through the reading interest inventory. There were check boxes about what types of books they like to read. What were their three favorite books? What was the last book they read that they liked? What was the last book they read that they didn't like? But one question that I was most interested in was... about how many chapter books did you read from start to finish last year? And then I had the answers of zero, 1-5, 6-10. 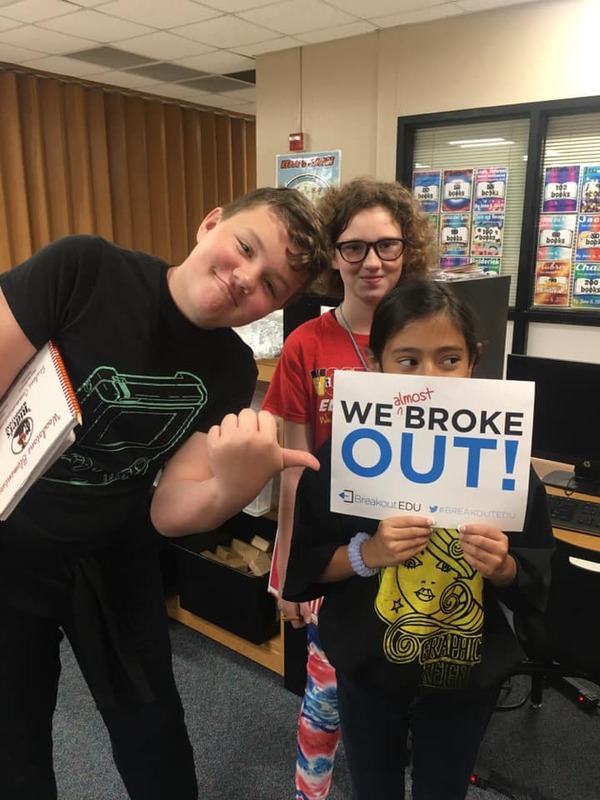 I explained that I wanted them to be honest and that maybe they hadn't read a chapter book last year because they only read nonfiction or graphic novels. Or maybe they hadn't found a chapter book they liked so they kept abandoning in the middle. I had a feeling there were quite a few zeroes and I wanted to let them know that for whatever the reason I wanted them to be honest. At the end of the inventory, I asked the students to think of a reading goal. It could be a small, short term goal or a bigger, year long goal. I told them to look back at their answers on this inventory to maybe get some ideas. I gave some examples like if they checked that they only read graphic novels that maybe their goal could be to try a different genre. Or if they did not read for pleasure at home, maybe their goal could be to read for 15 min at home for a week and see if they like it. We did talk about being realistic and reasonable for their goal. This student had not found a book that they "loved" yet. I liked this one so much I had to tweet and Facebook it! So while I didn't solve the reading problems of the world, I realized that we are not used to setting goals for ourselves. I did learn a lot about what kind of books my students like and don't like based on their answers. We are going to revisit these goals in the middle of year and check our progress. So more conversations to come. One of my big goals for our library this year is to talk about books and reading more... to become more of a community of readers. That is not just me, the librarian, talking about books, but the students and teachers talking and sharing about books as well. 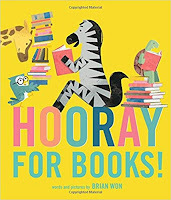 During the first week of school when the 3rd, 4th and 5th graders came to the library for the first time, I started by reading Hooray for Books! by Brian Won. 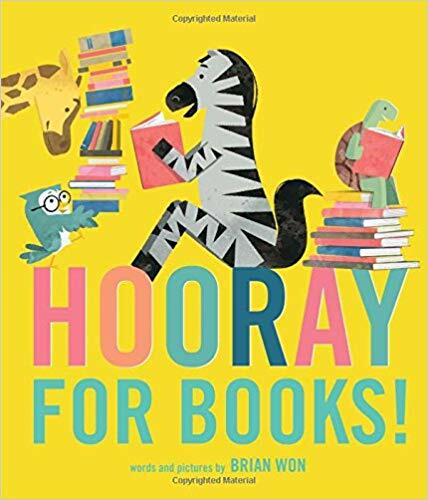 This book was perfect because turtle had shared his favorite book with zebra and when he went back to zebra to ask for it back, zebra had liked the book so much he had loaned it to another animal who had loaned it to another animal and so on. Which demonstrated my goal that books should not be kept a secret! Books are meant to be shared and when we find a book we like, we should talk about it! I explained to the students about my goal for us to talk about books more and share books that we like with each other in different ways this year. 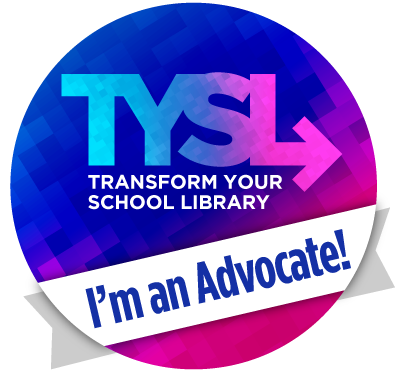 I am excited about this goal this year and can't wait to see all the sharing of awesome books we do!